– Ren clarifying clay cleanser; this cleanser is amazing for making skin feel fresher and deeply cleansed without feeling stripped or overly tight. It’s not the nicest smell in the whole world, and reminds me a bit of the smell of marzipan, but this is the only cleanser I’ll use when my skin starts acting out. – Origins out of trouble mask; after cleansing my skin, I like to use a mask if I’m breaking out. The out of trouble mask is some seriously potent stuff! It smells like vix vapour rub but it dramatically reduces the angry redness. – Salcura Activ liquid spray; After washing off a mask, or just my cleanser, I spray this on my face and it feels so soothing and lovely. It’s a bit cold, which feels so refreshing and mmm. It soothes the skin as well as reducing inflammation and nourishing the skin. If your skin gets sore when it breaks out, you neeeed this. 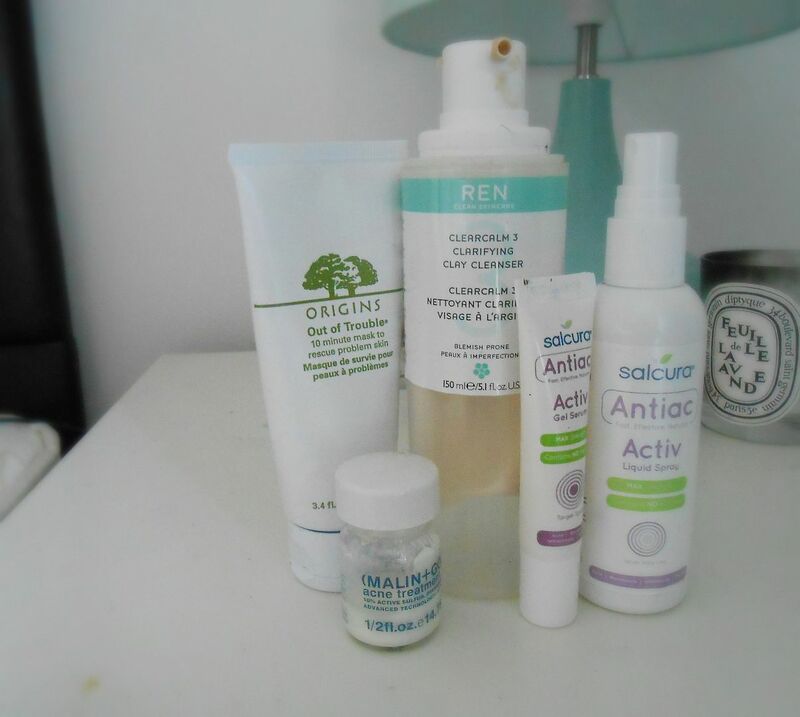 – Malin & Goetz acne treatment; After moisturising, usually with an oil, at night I apply some of this. It applies white and stays on until you wash it off, so it’s not one for the day time but overnight it really works its magic. – Salcura Activ gel serum; in the morning I apply this gel on any blemishes as it’s clear and you can’t see it. You can reapply this throughout the day on top of makeup as well, so it lives in my bag.